Regardless of your needs and tastes when it comes to hiking, no matter how good, experienced or a newbie you might be in this activity, it’s really sure you figured out by now that certain things are a must. Such as… hiking boots. Shopping online is a little bit more difficult (trying on your future boot is quite helpful), but a good manufacturer will give you either lots of info about their boots, or the possibility to return/change the item for not fitting right. On the other hand, it’s also up to the hiker to get informed, to know as much as she/he can about her/his trails, about the conditions and surroundings of her/his hikes. Answering the important questions is easy. Asking the right questions, however, is not. Did you think about where you are going to hike? Do you plan to go heavily backpacked, and walk all day long? Or only for a few hours, with a light weight on your back? This is an important question to answer before buying your hiking boots. Take, therefore, good consideration on the weight that your boots will have to support. Even though the boots go from lightweight to midweight and heavy weight, it’s good to know that a boot can be heavy weight and yet feel lightweight, on your feet. The best value women’s hiking boots tend to accomplish this demand, among a few other things. A good hiking boot comes with a good upper, also. Leather has the longest life span, but the best affordable women’s hiking boots will offer you at least a mix of materials (leather and synthetic) that can hold on for quite a while. Not only your ankles need good taking care, but your heels too. A good fitting and stabilizing heel cup will lock your heel into place and stabilize your entire foot. The best women’s hiking boots for the money will keep blisters away for sure. Most of the best price/quality women’s hiking boots feature an aggressive outsole; this type of outsole won’t let you slip and fall and, in more recent models, will produce minimum damage to the environment, while still giving you good traction. You may be surprised, but even the most affordable women’s hiking boots come with a waterproof/breathable membrane. It might be that not all the hikers out there think they will ever need waterproof boots, but it’s also obvious that, when it comes to weather, you may never be too sure… No matter how trustworthy your local weather man may be ;). And the reason why a boot has to be also breathable is because your feet may sweat up to 1 cup of water when you’re hiking. Unbelievable, right? When buying hiking boots online, some pointers for you ladies may help. Here below I’m gibing you the option to instantly find the best selling hiking boots (a good indicator of quality), the best items that, quality and price combined, are the winning combination. If your pocket is not as large, you can easily pick up your best pair of boots for less than $100 or even under $50. Keep in mind to take a look at the warranty of your boots as it may come in handy at some point. A respectable boot manufacturer will have a return policy and plenty of info about the products; read carefully when shopping, is my advice. We searched high and low and, in the end, we’ve came up with some categories that will cover most of your interests or needs when it comes to the best affordable women’s hiking boots. The money in your pocket will have the final word. Whether you want your boots to be one of the best sellers, or you want them to cost no more than $50, we found a way to include them here. You will find good and lower priced boots, and you will also find good and not that low priced boots. You’re the only one who can decide which „trail” to walk on when boot shopping, that’s for sure :). When it comes to the best price/quality ratio in women’s hiking boots, it seems that KEEN owns the secret recipe. The Women’s Voyageur Mid Hiking Boots are considered to be fantastic by customers, even though some had to go up a size when buying them. Made of leather and textile, these boots are made in the USA and feature a rubber sole. With a 4” shaft from the arch, a 2” heel and 1.25” platform, these boots will be a great, sturdy enough companion on your light backpacking hikes. Lightweight, stylish, offering great traction and comfort, they will not let any drop of water wet your feet since they have waterproof leather and a breathable mesh upper. 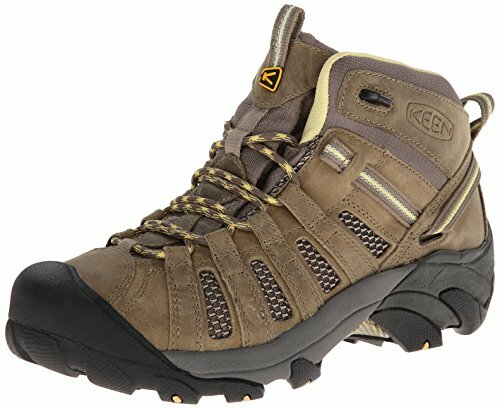 No break-in period will be necessary with these boots and everything about this boots „fights” for the comfort of your feet when hiking. The ventilated mesh lining, the protective stability shank, the gusseted tongue keep your feet away from blisters and tiredness. The only thing aggressive about this boots is …they have 4mm lugs that will let you „bite” into any rocky trails. Another product that caught our attention when it comes to the best quality/price ratio is the Columbia Women’s Newton Ridge Plus Hiking Boot. 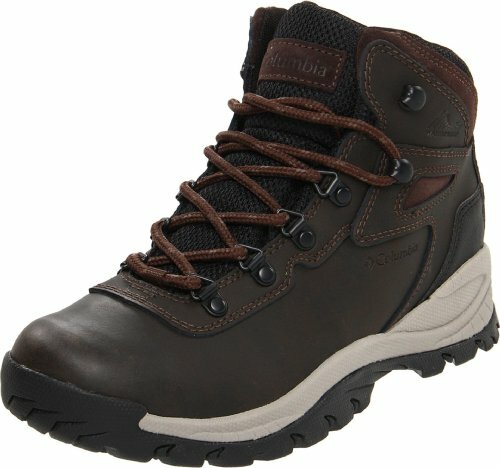 Coming as a „good to go” women’s hiking boots on any winter hike, these totally waterproof boots are made of leather and need some time to break in. With a rubber sole and a 4” shaft, these boots will feel light-weight and comfy from the very beginning. The waterproof full grain leather used for this boots will let no drop of water wet your feet; this is enforced by the “Omnishield” water and stain resistant treatment. At the same time, you will be able to hike as long as you want, blister free, thanks to the compression-molded EVA foam midsole. Light and warm, you are likely to buy these very good hiking boots again and again, because when it comes to price per quality, they will surely convince you.